Thermtronix® is renowned for its cutting edge solid state technology, high efficiency, and reliable gas-fired aluminum melting furnaces. All furnaces are factory assembled, pre-plumed and wired in the rear furnace enclosure and sent through rigorous full-load testing before they are shipped ready for operation. All these features combined help to increase efficiency, reduce metal contamination and energy loss, maintain structural integrity, and extend service life. Thermtronix® stands behind each and every product produced. All products are backed by an industry exclusive Total System Warranty that includes parts, labor and undeniable added value. The “Gold Standard” in aluminum melting technology. Thermtronix® GS-Series Aluminum Melting Furnaces are made to perform under rigorous conditions, are extremely reliable and energy efficient. The IRI type fuel train includes UL listed and approved gas pressure switches and flame safety control panels constructed to meet or exceed all safety standards of Underwriters Laboratories, Inc. (UL). The crucible type furnace design allows for easy alloy changes while the speed of gas-fired melting permits rapid metal breakdown and quick temperature adjustments. Additionally, a refractory lined flue extension reduces noise levels and moves heat and fumes above operator level for a more comfortable working environment. GS-Series Gas Fired Solid State Aluminum Melting Furnaces are available in various sizes ranging from 300 lbs. to 2,000 lbs. aluminum capacity. The Thermtronix® GT-Series Gas Fired Solid State Hydraulic Tilt Aluminum Melting Furnace was made to melt faster, more efficiently and more reliably than any other of its kind on the market today. 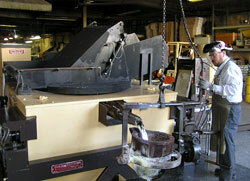 This workhorse can be found wherever large aluminum pours or master melts are required with a gas fired furnace. All GT-Series furnaces include UL Listed and approved flame safety control panels engineered to meet or exceed all safety standards of Underwriters Laboratories, Inc. (UL). Just another example of Thermtronix® continued commitment to excellence. Available in sizes ranging from 400 lbs. to 3,000 lbs. aluminum capacity. 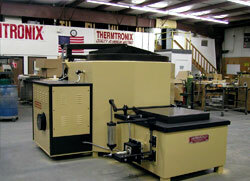 Thermtronix® non-crucible furnace is designed for continuous melting aluminum operations. 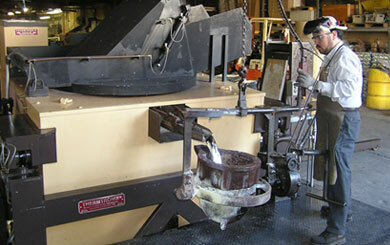 It is a durable refractory lined furnace that eliminates the use of crucibles. 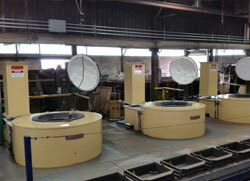 GC-Series Non-Crucible Gas Fired Solid State Aluminum Melting Furnaces are available in sizes ranging from 1,500 lbs. to 5,000 lbs. aluminum capacity. Dry hearth charging chamber (on a small to medium size melting furnace) heightens operator’s safety. Improves operating efficiency by capturing exhaust energy to preheat and melt the new charge. Easily accessed for routine cleaning and maintenance through a manually operated top access cover. Improved metal quality: slag, dross and residuals from the melt remain on the dry hearth. It’s easily and completely removed, resulting in less post melt processing. The Thermtronix® High-Bay Furnace truly changed the way the world melts aluminum. This patented technology allows operators to sequentially melt and simultaneously hold, process and adjust temperatures with multiple alloys in a single large capacity central/bulk melt furnace at less than 1200 BTU per pound of aluminum melted. 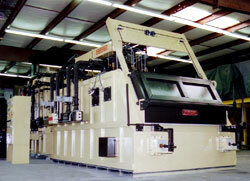 HB-Series High-Bay Gas Fired Solid State Aluminum Melting Furnaces are available in sizes ranging from 6,000 lbs. to 30,000 lbs. aluminum capacity. Higher overall efficiency than conventional gas and oil fired reverberatory type units. Allows for charging of loose or stacked ingots, sows, gates and risers—or a combination of the three. All Thermtronix® gas-fired furnaces include UL Listed and approved flame safety control panels engineered to meet or exceed all safety standards of Underwriters Laboratories, Inc. (UL). This leading edge technology provides maximum efficiency, precise temperature control and proven reliability. Just another example of Thermtronix® continued commitment to excellence. 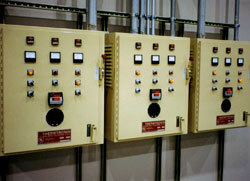 Thermtronix® 100% solid state power and flame control is a guarantee for years of trouble-free operation. The flame safety monitoring system checks for proper ignition, pilot flame, and provides a preprogrammed purge cycle before opening main gas valves. The system also continuously monitors for proper flame, safety interlock, gas pressure, air pressure, electrical control power, and displays both normal operating and diagnostic messages on an easy to read LED display.